Contact us for your free no obligation consultation. Apply to be contacted by our staff. Yes, we employ our Caregivers. They are bonded and covered by general liability and workers compensation. Do you provide care services to those in assisted living facilities or nursing homes? Yes, our Caregivers can provide personal care and companionship to those who may need or desire additional attention day or night. AT HOME WITH YOU even offers hospital sitting for clients who may need or desire more personalized attention. Long-term or short-term needs, we offer families peace of mind. How do I get to meet the Caregiver? At the initial consultation visit with a Home Health Care experienced Registered Nurse, a Plan of Care will be developed addressing the needs and requests of the client and family. The Registered Nurse will select the best fitted Caregiver and arrange an introduction and orientation with the client in their home. The plan of care will be reviewed to ensure that everyone is in agreement with the Caregiver selection and service agreement. Will I have the same Caregiver? Continuity is an important part of our care with AT HOME WITH YOU. We will strive to provide the same Caregiver, or Caregivers, depending upon the amount of hours and/or days you require for service. If we are providing multiple Caregivers to staff your needs, our Home Health Care experienced Registered Nurse will introduce and orient them to you individually. What if my Caregiver is ill or on vacation? 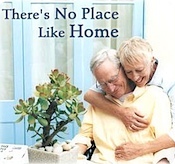 AT HOME WITH YOU employs a team of Caregivers; we will make every effort to provide uninterrupted home care services. A Registered Nurse will evaluate your needs to find an appropriate replacement, review your Plan of Care with the replacement Caregiver, and orient them as needed. Does insurance pay for these services? Long-term care insurance may cover these expenses as well as Veteran’s Benefits. If a client requests, we are happy to assist in providing necessary documentation to assist you in submitting claims for your reimbursement. Do I have to commit to a minimum amount of hours? Can I cancel or change my services? AT HOME WITH YOU has no minimum requirement for hours. You are the boss; you can cancel or change your service at any time. We just request you give us a 7 day notice for termination. Accordingly, we will review your plan of care at least once every 6 months to make sure we are providing you with the best possible care. What do Caregiver services cost? Caregiver service rates vary depending upon services and hours required. Please call or schedule a complimentary meeting with one of our Home Health Care experienced Registered Nurses to discuss available services and costs. The At Home With You logo is ©2011 By At Home With You, USA, All Rights Reserved.